The 2019 Toyota Camry is a 5 passenger Automatic transmission, 4-door Mid-Size Passenger Car. It is available in 10 trim packages, the Hybrid LE, Hybrid SE, Hybrid XLE, L, LE, SE, XLE, XLE V6, XSE, and XSE V6. The new Toyota Camry invoice price ranges from $21,909 to $31,578, while MSRP ranges from $23,945 to $34,700. 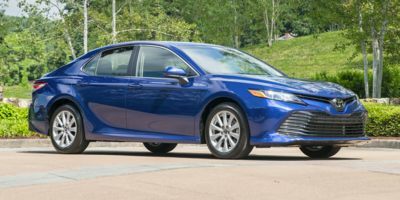 The 2019 Toyota Camry is available in 13 exterior colors, Blue Streak Metallic, Blue Streak/Midnight Black Metallic, Brownstone, Celestial Silver Metallic, Celestial Silver/Midnight Black Metallic, Galactic Aqua Mica, Midnight Black Metallic, Midnight Black Metallic/Wind Chill Pearl, Predawn Gray Mica, Ruby Flare Pearl, Super White, Supersonic Red, and Wind Chill Pearl, and 4 interior colors, Ash, Black, Cockpit Red, and Macadamia.